This dunk tank features a collapsible feature and fits in very small entryways. This is a great alternative for those that have fenced yards or other small entryway restrictions. A dunk tank is one of those iconic carnival/party attractions that everybody, big and small will enjoy. The game is simple, a player hits the target and if successful, the “victim” falls into the dunk tank. This is game of chance, and anticipation. 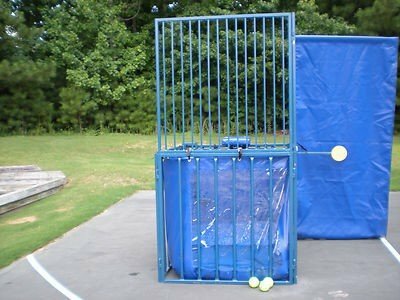 A dunk tank is a great idea for fundraising at schools, churches or other organizations. It is also a great addition to any fun outdoor party or event.